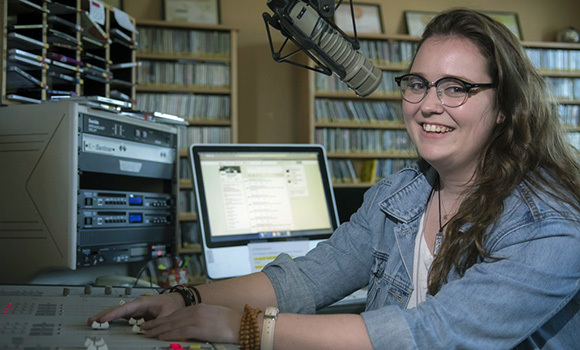 Senior Jen Nelson has worked at WUAG, UNCG's radio station, since she arrived on campus as a freshman. And her interest in music isn’t just a hobby – it’s also the focus of her research. Tucked away on the third floor of UNCG’s Brown Building is WUAG 103.1 FM ­– UNCG’s radio station since 1964. The DJ booth is full of CDs, vinyl and vintage band posters. It’s run by students from across academic disciplines, including senior Jen Nelson – an English major with a political science minor and a love for Greensboro’s underground music scene. Nelson became a DJ as a freshman, and has worked as promotions director, general manager and now program director. Nelson’s interest in music isn’t just a hobby – it’s also the focus of her research. As a student in UNCG’s Lloyd International Honors College, Nelson has spent the past year and a half working on her honors thesis, which explores the way that modernist poets – T.S. Eliot and others – use music and musical references in their work. Her research led her to London last summer, where she spent two weeks at the prestigious T.S. Eliot International Summer School thanks to a globally engaged undergraduate research grant. The school brings together some of the top scholars and students in the field. Her international experience also includes Northern Ireland, where she studied abroad in the fall. For Nelson, her time in Europe was marked by personal growth. “I learned that I could be completely independent, and I met the most amazing people,” she said. After graduation, Nelson plans to take some time off to travel and teach before she begins to apply to graduate schools. Her advice for the Class of 2021? Build close relationships with faculty.